February 16, 2015 – Plumes seen reaching high above the surface of Mars are causing a stir among scientists studying the atmosphere on the Red Planet. 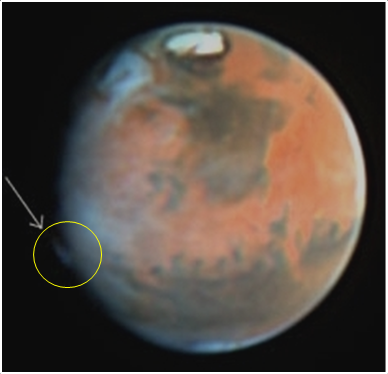 On two separate occasions in March and April 2012, amateur astronomers reported definite plume-like features developing on the planet. None of the spacecraft orbiting Mars saw the features because of their viewing geometries and illumination conditions at the time. 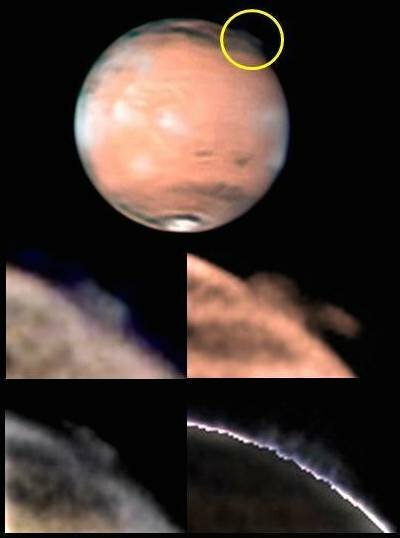 However, checking archived Hubble Space Telescope images taken between 1995 and 1999 and of databases of amateur images spanning 2001 to 2014 revealed occasional clouds at the limb of Mars, albeit usually only up to 100 km in altitude. But one set of Hubble images from 17 May 1997 revealed an abnormally high plume, similar to that spotted by the amateur astronomers in 2012. The jury is still out on the nature and genesis of these curious high-altitude martian plumes. Further insights should be possible following the arrival of the European Space Agency’s ExoMars Trace Gas Orbiter at the Red Planet, scheduled for launch in 2016.